Atlantic Maintenance Group offers a full suite of asphalt and concrete services to commercial and residential properties in Maryland, Virginia, Pennsylvania and Delaware. Whether your project is installation or repair, parking lots or sidewalks, or anything in between, we have the expertise to complete your project to the highest standards. We specialize in asphalt paving for installation, repair and resurfacing of commercial parking lots, driveways and walkways. We also provide asphalt patching services for smaller areas of concern. Whether you need to install a new concrete ramp for ADA compliance or resurface an existing sidewalk for aesthetic purposes, Atlantic Maintenance Group’s trained professionals deliver the highest quality workmanship on all our concrete services. Don’t overlook curbs and gutters when considering the maintenance of your commercial property – there’s a reason they call it “curb appeal”. We can repair or replace concrete curbs and gutters for a dramatic improvement to the look of your facility. We start by clearing the area of loose debris and applying crack sealer to cracks or damaged asphalt. After this rigorous preparation process, we apply high quality sealant to protect and extend the life of your asphalt. 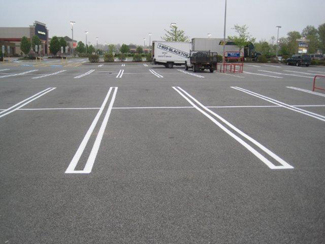 Parking lot line striping requires extreme precision in both the planning and painting phases. We can restripe an existing parking lot or plan out new line striping as needed. Cracks in concrete or asphalt may be caused by poor installation, earth movement, tree roots, or a variety of other issues. Repairing these cracks quickly and professionally can prevent more costly damage from occurring. Receive your free quote for asphalt and concrete services from Atlantic Maintenance Group.